The cableway in Tianmen Mountain is the world's longest at a length of 24,458 feet (7,455 meters). It begins in the City Garden downtown, and ends on the summit. It hangs like a rainbow, and hints of being a dragon in the clouds. The cableway throughput is 1,000 passengers per hour, and it averages 28 minutes per trip. In high season you have to wait in line for hours. Heaven-linking Avenue, also known as 99 Bending Road or Big Gate Road, is a most hazardous road. It was built in 1998 with 99 consecutive turnings, and a total length of 6.7 miles (10.77 kilometres) was the road wonder. You can watch it from the cable car. You can also get to the mountaintop by this road with the shuttle bus of Tianmen Mountain scenic area. The principal attraction on Tianmen Mountain, Tianmen Cave is a grand karst cave 431 feet high, 187 feet wide and 197 feet deep spanning under the mountain. Looking from afar, the cave looks like a way up to the heaven, hence the name, Tianmen, meaning Heavenly Door. The cave is shrouded by the year-round dense mists. Sometimes, cloaks of clouds gather at the cave's opening, with the sun glowing through it. , forming magical scenery. Tianmen Mountain Temple, on 5 acres of land, and featured by the overhanging eaves, is the western Hunan regional Buddhism centre. It started building in the Ming Dynasty (1368-1644) and rebuilt in 2002. The temple enshrines one of the five relics of Sakyamuni Buddha in China. From the square in front of the temple, you get a panoramic view of the mountain. 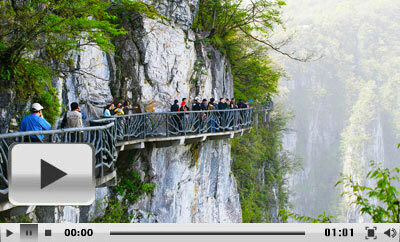 The glass skywalk marks the Tianmen Mountain tour climax. It is most fitting for the adventurous. On sunny days, the blue sky and white clouds accompany your walk. You will be both pleased and shocked by the sensation of walking on the clouds and the drop into the void below your feet. On cloudy days, the view of the glass corridor itself is a sensation. Now there are three glass skywalks in the east, west and Panlong Cliff respectively. Take bus 1A, 1B, 10A, or 13 and get off at Tianmen Mountain Cable Car Company Station. Then walk 240 yards (220 meters) to take the cable car or shuttle bus to the scenic area. Take bus 4 and get off at Tianmen Mountain Cable Car Station. Then take the cable car or shuttle bus to the scenic area. Take bus 5, 6, 8 and get off at Flower of the Peace International Hotel Station. Then walk 400 yards (360 meters) to the downward cableway station. Taxi costs you CNY 10 from downtown area to the City Garden cableway station, and CNY 30 when coming from the airport. The transport includes single-way cableway, shuttle bus, and the upper escalator between Tiammen Cave and the mountaintop. Note: Free for children measuring below 4.2 feet (1.3 meters) and under 6 years old. CNY 148 for tourists between 6 and 18 years old. Surcharge inside the Scenic Spot Peak forest cableway on the mountaintop: CNY 25 for single-way; the concessionary fare (see * below) is CNY 15. The lower escalator to Tianmen cave: CNY 32 for single-way; the concessionary fare is CNY 20. Note: Free for children below 4.2 feet (1.3 meters). * Concessionary fare is applied to tourists taller than 4.2 feet (1.3 meters) and under 18 years old. A pair of shoe covers for glass skywalk is CNY 5. I'll arrive at the Zhangjiajie Airport at 11:20, so I'll do a late visit to the mountain. I will arrive at 1420 by train, will I have enough time to start at 1500 and do both the East and West glass walk ? Is the closing time 1700 or 1800 on April 1 ? Google search said it close at 1800 today. I'm afraid the time is not enough. It closes at 17:00 and stop selling tickets at 16:00.
is low season or should we expect to queue for hours? Hi, since the May 1 is a public holiday and you may need to queue in some hot spots like the Glass Bridge and cable cars. We explored this area last year and spent 4 busy days doing it. In relation to this mountain it took 1.5 hours of queueing to get in the cable car to start the journey. The whole experience was breathtaking. You will need to stay in a town called Zhangjiajie--this is also where the airport is. About an hour up the road is a town called WULINGYUAN where we stayed and done some more exploring .TIANZI Mountain (where they filmed the 3d movie AVATAR) is where the national park is (called Zhangjiajie). Lots to do there --largest cave in Asia--430 metre glass walkway--Baofeng Lake--Ten mile gallery--bailong elevator--cable car and more. Visit Zhangjiajie Tianmen Shan after 13:00? I will arrive at Zhangjiajie train station around 13:00. Is there enough time to visit Tianmen Shan on the same day? Yes, you have enough time to tour around. Generally speaking, the suggested sightseeing time is 3-4 hours. Is one full day enough ? Is the RM258 ticket valid for one day or two days ? Is early April crowded ? The opening hours of this scenic area is 08:00 to 17:00. One day is enough for you to tour around. The entrance ticket fare is CNY258/person valid for 2 days. Generally speaking, early April won't have too much tourists. Have a nice journey! Just know that 258Y ticket is valid for 2 days. So, I can take the cable-way up the mountain and get down on both days without extra charge. Am I understand correct? Or have a hotel on the mountain? If you stay inside the mountain area, then you don't need to pay the extra entrance ticket.